Life in a sunny city by the Pacific Ocean doesn’t sound bad, does it? 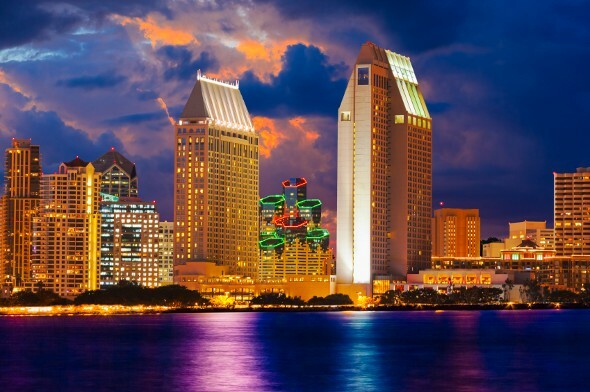 If you’re considering moving to San Diego a) we don’t blame you and b) you’re probably wondering whether you can afford to live in what’s officially nicknamed America’s Finest City. SmartAsset has you covered with our guide to the true cost of living in San Diego, also known as the Plymouth of the West. Does the idea of living in the avocado capital of the US sound too good to be true? Well, you can live that dream if you move to San Diego. San Diego County, of which San Diego is the county seat, is the country’s biggest producer of avocados. San Diego itself has more farms than any other city in the country. Are residents of the San Diego city earning enough to cover all those farmers market trips? 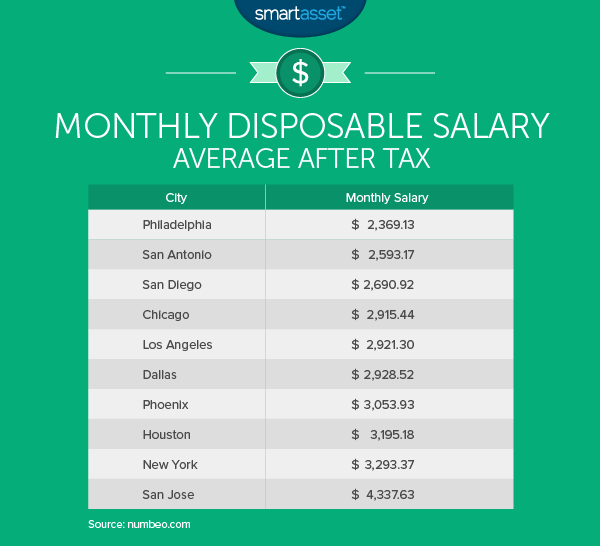 Take a look at the chart below to see how monthly income in San Diego compares to other major US cities. Home prices in San Diego don’t approach the crazy-expensive levels of San Francisco and San Jose. According to trulia.com, a one-bedroom home in San Diego will cost you around $255,000. Need two bedrooms? Expect to pay around $399,000. Things get pretty steep if you upgrade to three bedrooms ($528,500) or four bedrooms ($681,000). The average home price for all properties is $490,000. If you want some help with sorting out your finances before you buy a home, these are San Diego’s top 10 financial advisor firms. Not ready for the commitment of a mortgage or don’t yet have the savings for a down payment? According to myapartmentmap.com, the average rent for a San Diego studio is $1,465. Rents on a one-bedroom in the city average $1,547. Average rent rises to $2,060 for a two-bedroom and $2,631 for a three-bedroom. Depending on where you’re from, those rents may sound outrageous. In fact, though, the San Diego price-to-rent ratio is high, meaning that renting could be a better deal than buying. Of course, your rent-or-buy decision will depend on your specific financial situation but conventional wisdom is that a price-to-rent ratio over 15 indicates a renter-friendly market. 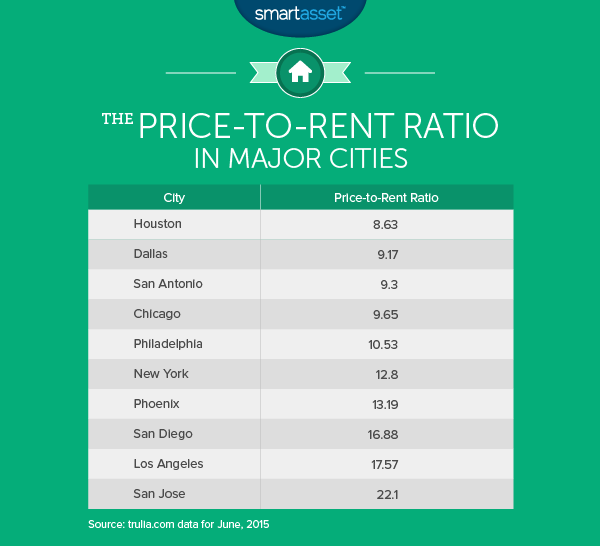 Take a look at the chart to see how San Diego’s price-to-rent ratio compares to other big American cities. Housing is one of the major drivers of the cost of living in San Diego but it’s not the only factor to consider. According to numbeo.com a basic package of utilities for a 915-square foot apartment in San Diego costs an average of $117.04 per month. That includes electricity, water, heating and garbage. If you want to add internet (and we’re guessing you do) you can expect to pay a further $57.27 per month. Once you have your housing and utilities taken care of you need to think about how you’ll get around. A monthly pass on San Diego’s public transit system costs $72. Let’s be honest, though. San Diego is a driving city. According to gasbuddy.com you can expect to pay $3.70 for a gallon of gas. That’s 4.5% above the California average of $3.54 and 40% above the national average of $2.64. We’re guessing San Diego residents don’t live off avocados alone, tempting as that sounds. Let’s take a look at how food prices in San Diego stack up. A three-course meal for two in a mid-range restaurant will cost you $60, according to numbeo.com. The same source puts the cost of a meal in an inexpensive restaurant at $12. Prefer to save money by cooking at home? Numbeo’s recommended minimum amount of money for food for one person for a month in San Diego is $316.48. All the farm-fresh food and vitamin D available in San Diego should help you keep your health game strong. If you do visit the doctor, expect to pay around $145 for a preventive primary care visit in San Diego, according to castlighthealth.com. That $145 is in the middle of the pack for California cities. It’s more expensive than Fresno ($117) and Los Angeles ($121) but cheaper than Sacramento ($219) and San Francisco ($251). California is known for its high taxes. In fact, it’s the highest-tax state in the nation. If you want to see what your tax burden will be like in California check out our free tax calculator. As far as San Diego-specific taxes go, the situation could be worse. The San Diego sales tax rate is 8%. The average effective property tax rate is $1.179%. You don’t want your hypothetical San Diego life to be all work and no play, do you? Let’s talk about the non-essential side of the cost of living in San Diego. If you’re over 12 years of age, a ticket to the famed San Diego Zoo will cost you $48. A ticket for a child aged 3 to 11 is $38. That’s the bad news. The good news is that the San Diego Padres have the cheapest tickets in all of Major League Baseball. According to Team Marketing Report, the average price of a Padres ticket is just $16.37. For reference, the highest-price tickets in baseball are Red Sox tickets, at $52.34. The league-wide average is $28.94. Prefer something a little more high-brow? An adult ticket to the San Diego Museum of Art will cost you $12. It’s $10 for the Museum of Contemporary Art and $14 for the San Diego Botanical Garden. There’s something for everyone in America’s Finest City. So you’ve decided you’re moving to San Diego. You probably want to see how your budget will be affected. SmartAsset’s California paycheck calculator can help you determine how living in the Golden State will impact your take-home pay.